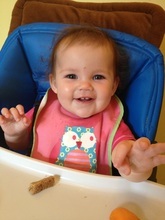 Breakfast was one of the first meals we used to try out baby-led weaning with Amelia. I struggled at first to think of sensible alternatives to breakfast cereal, which is far too salty and sugary normally for a little one, and generally not gluten free, but we have come up with a few successful ideas. Toast! This was really the first hit as far as properly eating food and not just playing with it went. I use the Genius sliced white or brown loaf as it is far superior in taste and texture to most other gluten-free breads I have come across. It does not have a lot of salt in, less than regular bread, and the brown loaf has added seeds. To start off, she just had little soldiers with butter on. Sometimes I would add cream cheese, or jam to make it interesting (but much messier!) and now she has honey. I avoided the brown bread to start off with as I thought there would be too much fibre for her little tummy, but now we alternate depending on what is available in the shops. Cereal... I don't like most of the gluten free cereals available. They are bland and cardboardy. But I have finally found a solution which works well when mixed with other things. 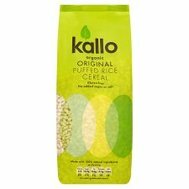 Kallo organic puffed rice has no salt or sugar at all, just rice, and goes with anything! There is also a sweetened version with honey, but I haven't used this with Amelia. I found a bowl of cereal with lots of milk was a useless idea for someone who eats with her fingers, and it goes everywhere! So I put a little milk to soak into the rice, and then stir in some Greek yoghurt, which makes it clump together in useful grabable lumps. I also mix in some chopped up dried or fresh fruit, especially sultanas, apricots, banana and blueberry. Fruit. 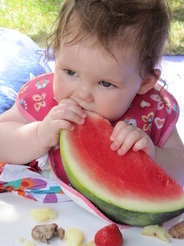 Over the summer especially, we found melon and strawberries were the biggest hits and were great as she was just starting out with BLW. She still loves fresh fruit but now it is winter I tend to give her a banana or apple instead, which goes down well. 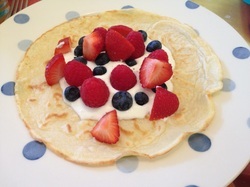 Blueberries were quite a late discovery for us, but were soon a firm favourite. She eats lots of dried fruit, it's great for snacks as well.